Digital Humanities at the DHI Roma contribute to humanities research projects promoted by the Institute, by the Max Weber Stiftung and by other academic cooperation partners, supporting the design, planning and development of digital components. Currently, the DHI Roma manages 20 digital editions, databases, inventories and specialized research systems. 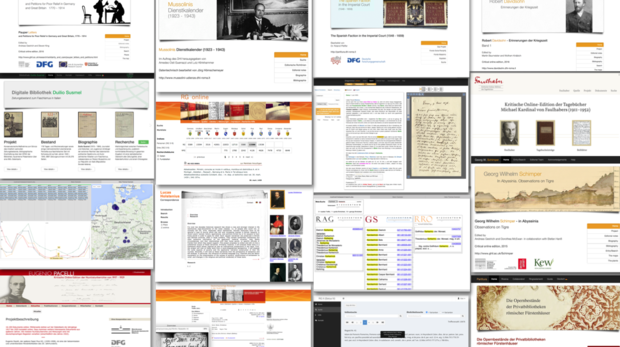 DHI Roma Digital Humanities were developed as an interdisciplinary science spanning different eras and are closely linked to the Institute's research activity and main areas of interest. Cooperation projects with our partners range from continuous in-progress consultation, to the design and implementation of technical solutions for data modelling, as well as for digital work and web-publishing contexts, through to long-term web application hosting.